Answering delays. Delays in a call being answered can be frustrating. 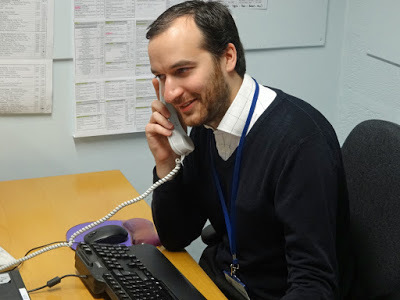 If you work in a dispensary, MI centre, or a clinical pharmacy office where there are sometimes more phones than there are people to answer them, use technology to divert phones so that the number of staff and phones are equal. You should also have a policy in your team of answering phone calls within a certain number of rings. If not, why not suggest introducing one? Wrong person. If you are not the most appropriate person to speak to when someone phones up, do try to interrupt them before they have given you ten minutes worth of information! You can either take details and ask the correct person to phone them back, or simply transfer the call. On hold. People do not like being left on hold without explanation or for seemingly endless periods. Give an explanation of why they are being put on hold, how long it will take, or better still offer to ring them back later if that is appropriate. Identity. Make sure you identify yourself and your position when you answer the phone. If you forget, then do so before its conclusion. This makes the enquirer feel safe that an individual is responsible for his/ her problem and knows who to speak to if calling again. Listening. Don’t let the person on the phone think that you’re distracted or not paying attention. Make sure that you give them the opportunity to express him/ herself and their individual needs. Do not fall into the trap of thinking: “Another question about X – the answer is Y”. Finally, a quick word about answerphones or voicemail. Many people don't like to leave recorded messages so you should be aware of this fact if you use these facilities at work. When a message is left, you should try to reply within a relatively short time even if only to confirm that the message has been received. Messages often contain incomplete information anyway, so this can be your ‘excuse’ to ring the enquirer back, thereby giving them reassurance that you have received their problem and are working on it.